Victorian era costumes have made a resurgence with the popularity of Victorian Steampunk style. The Victorian Era began in 1837 and ended at the death of Queen Victoria in 1901. This was the age of modesty, and the clothing styles represented society's prevailing morality with high collars, low hemlines and hats. Men, women and children dressed in elaborate garments -- which you can revive for costume parties, plays and Christmas outings. Taffeta and satin were popular fabric choices for Victorian women’s clothing and are well-suited for costume fabrics. Victorian women often wore elaborate gowns with tight-fitting bodices. Costume enthusiasts should choose garments that mimic this style. Victorian bodices should be closed, with buttons or back laces, and should have loose-fitting sleeves. Victorian gowns must also have high necklines and lace collars. The dress skirts may either be hoop style or bustled. Both styles of dress should be adorned with frills, and flounces on both the skirt and the bodice. Popular color choices include green, blue and rose. Women typically adorned their hair with matching colored ribbon. Men’s Victorian clothing must be refined. Victorian men wore long frock cloaks over long-sleeved linen shirts with upturned collars. Costumes must also include either breeches or trousers. These pants were tapered and usually gray, black or tan. Men often wore wide neckties, cravats or ascots. Occasionally, Victorian men wore simple ribbon-styled neckties, tied at the neck, or scarves. Young children from infancy to around four years wore the same styles: boys and girls both wore pleated skirts and dresses that tied in the back. As the children aged, their fashions changed. Victorian girls wore knee-length dresses until they turned 16. At that age, they wore adaptations of adult women's fashions that were ankle length. Victorian boys wore knee pants, linen shirts and coats until they were preteens. They then wore the same fashions as their fathers. Victorian costumes must have accessories. Hair ribbons were worn by both girls and women. 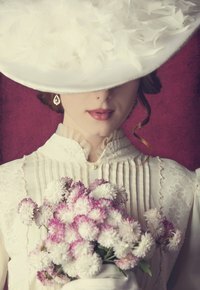 Men and women of the Victorian era wore hats. Men often wore top hats, and Victorian women wore extravagant hats. Women's hats were traditionally felt and were trimmed with feathers, flowers and bows. Women might also complete their outfits with a matching shawl.